KJIPUKTUK (Halifax) – There are signs the proposed Goldboro Liquefied Natural Gas (LNG) plant in Guysborough County is getting ever closer to ramping up. People concerned about climate change say that once in production the facility will make it difficult for Nova Scotia to meet its greenhouse gas (GHC) reduction targets. 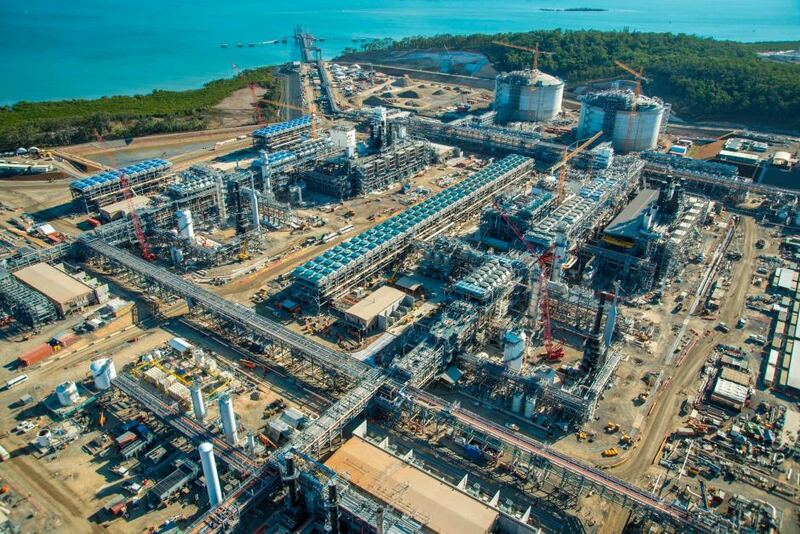 An LNG plant nearing completion in Australia. This plant is smaller than the projected first phase of the Goldboro LNG plant. Nova Scotia has granted all the required environmental approvals to two separate LNG export facilities, Goldboro being one of them, with a third application being considered. The Liberal government has approved and supported these projects despite the fact that even one of these facilities will singlehandedly increase Nova Scotia’s 2022 greenhouse house gas emission targets by up to 23%. Industry analysts have consistently dismissed the economic viability of these East Coast projects. And the failure of one after another well funded proposed LNG mega project in British Columbia was widely understood to corroborate this dim assessment of the prospects for any Nova Scotia LNG plants. This may explain why LNG remains pretty much under the radar of Nova Scotia environmental groups. Despite all this, it appears that the Goldboro LNG plant owner, Pieridae Energy, is getting close to starting construction on the $10 billion project in Guysborough County sometime this spring, with processing and export to begin four years later. An LNG export facility is an extremely expensive and complex undertaking. The Goldboro LNG plant will be about 50 times larger than the controversial Alton Gas Storage project. And the plant will emit more greenhouse gases than the province’s two pulp mills combined. Nova Scotians are accustomed to grandiose announcements of mega projects that do not materialize. But the investment required for an LNG plant, and all of its complex implementation elements, means that once the proponents commit to the final investment decision (FID) they tend to not pull back. The scrubbing of the British Columbia LNG projects occurred just before each project was due to make it’s FID. Prominent energy analysts simply dismissed the possibility that an independent like the promoter of Goldboro LNG could succeed where the global majors have failed. But Pieridae CEO Alfred Sorensen has substantial cash of his own, and has quietly assembled the pieces he needs for the Goldboro project. Sorensen’s company Pieridae a few years back secured a German customer on a 20-year contract, at an LNG volume enough to make the proposed plant viable. By itself, this contract rightfully impressed no one. Of course the Germans will buy the LNG as a hedge against Russia as their dominant supplier. Whether Pieridae could deliver that LNG was another matter. But along the way Sorensen has quietly secured a loan guarantee from the German government for construction of the LNG plant. Other investors are still required, but Pieridae became far more attractive with the guaranteed access to credit at prime rates. With that German loan guarantee the company will also be able to offer credit to its customers, a major advantage over new competitor LNG plants in the United States. All of these strategic and cost advantages have improved Pieridae’s chances to secure enough deep pocket equity investors. Courting those investors was the purpose of invitations to attend a recent high powered Nova Scotia show and tell hosted with “project partners.” The partners included Uniper, the turnkey German utility customer; and no doubt included Euler Hermes Canada, the Canadian representatives for the German governmental agency providing the crucial loan guarantee for strategic political reasons. Where regasified LNG in Germany replaces existing natural gas consumption, there would be very little GHG emission effect in Germany. Where the LNG displaces the burning of coal in power plants, there would be a decrease of GHG emissions, in Germany. This is the justification former BC Premier and chief LNG cheerleader Christy Clarke used: the increase in British Columbia greenhouse gas (GHG) emissions would supposedly be “justified” by the lower emissions associated with natural gas. Borders and even vast oceans make no difference when it comes to GHG emissions- it all goes up into the one atmosphere our planet has. Over the whole extraction-to-burning life cycle, LNG is actually worse than burning coal. Most gas available for LNG processing and export is extracted through hydraulic fracturing, a process notable for its fugitive methane emissions. Further emissions are released while compressing the gas into LNG for transportation on tankers. Stephen Thomas, Energy Campaign Coordinator for Ecology Action Centre, is very concerned about the climate impacts of the LNG industry. “The plants have the potential to undo the good work Nova Scotia has done in reducing greenhouse gas emissions and building the green economy here at home,” he says. Thomas added that if all three LNG plants are built, it could add more than 7.5 million tonnes of greenhouse gas emissions, which would increase the 2022 provincial emissions by about 70 percent. With the explosive growth of hydraulically fractured extraction methods, natural gas has become very cheap. Even with the significant added liquefaction costs, LNG still is a comparatively cheap mode of fossil fuel. But the emission-intensity Stephen Thomas spoke of makes LNG a remarkably inefficient fossil fuel. Those massive GHG emissions from the proposed LNG plant in Goldboro could still prove to be a hurdle that may slow down Pieridae’s efforts in the coming months. The company needs more large investors, and is able to court investors with deep pockets because the company has sufficiently nailed down the major variable component costs of the project. Pieridae can head for the finish line only if it keeps those costs in line. However, the costs associated with carbon pricing of the GHC emissions remain unknown, and that could spell trouble for Pieridae. When the federal government allowed Nova Scotia to bring in a cap-and-trade carbon pricing system instead of a carbon tax, Stephen MacNeil’s government chose to give the large emitters of Nova Scotia a free pass for their existing GHG emissions. There is no direct carbon pricing cost for them. Instead, new emitters will have to buy “credits” for their GHG emissions. How that will work will only be revealed in the fall of this year. If and when the Goldboro LNG plant comes online as the largest GHG emitter in the province, the amount of credits Pieridae needs to buy will utterly swamp the demand for emission credits. The amount the company pays for the credits it needs will be determined by how the province uses its discretion to structure the system. Since the Liberal government has for its entire term enthusiastically promoted these LNG plants, there is obvious concern how they use that discretion. When considering the glowing promises of what LNG can do for Nova Scotians, keep in mind the permanent employment projected at the plant is estimated to be 175 people. Jobs for 175 people is not a trivial matter. But for that number of jobs we would completely wipe out our hard fought targeted reductions in GHG emissions. Meanwhile, Nova Scotia doesn’t offer much support to green economy opportunities distributed across the province – providing jobs in small local businesses that reduce GHG emissions and pay their way with energy cost reductions. If you can, please support the Nova Scotia Advocate so that it can continue to cover issues such as poverty, racism, exclusion, workers’ rights and the environment in Nova Scotia. A pay wall is not an option, since it would exclude many readers who don’t have any disposable income at all. We rely entirely on one-time donations and a small group of super nice monthly sustainers. Next Post Heritage Day in Nova Scotia has come and gone – but did you get a paid holiday? While some will build … there are others who will tear down … it is ok to tear down if one can offer a viable constructive proposal! CAPP tried that on me, even trotted out an impressive study. Problem is the study did not back up that claim. Read this response: http://thechronicleherald.ca/business/1554753-rebuttal-lng-would-toss-us-out-of-the-frying-pan-and-into-the-fire. Besides, Uniper the huge German utility buying all the LNG will use it to replace other natural gas, not coal fired electricity. They just completed last year the largest coal fired plant in Europe- burning dirty German soft coal.